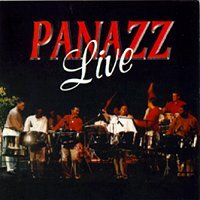 Panazz Live was recorded at the band's annual concert in Trinidad. It captures the spontaneity of their live performances; and the local compositions illustrate best how Pan conveys happiness and joy. Internationally, Panazz has most recently participated in the BankBoston Celebrity Series at Symphony Hall in March 1997 as the opening act, and as the headliner in November 1998. Prior to this, Panazz performed for the United Nations in Japan in November 1996. Other performances include World Travel Market Exposition at Earl's Court, London in November 1995; the Africa in April celebrations, Memphis, TN in April 1996; and Pigeon Island, St. Lucia for the 1996 Jazz Festival. The band performs continually for several corporate organizations and other gala events.